This is the summary of consumer reviews for Dreambaby Madison Xtra Tall Swing Close Gate Combo Pack. The BoolPool rating for this product is Excellent, with 4.70 stars, and the price range is $59.98-$69.99. 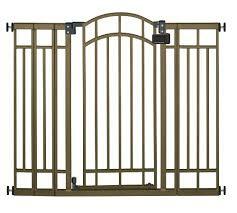 The Dreambaby Madison Xtra Tall Swing Close Gate Combo Pack comes with one 3.5" extension and one 7.0" extension. It fits an opening of 28"- 42.5" using the included extensions. The door opens in both direction and closes automatically. It is pressure mounted and very easy to install. The gate does come with mounting cups for optional use. 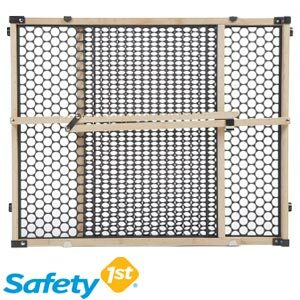 This durable and sturdy gate keeps children safe from harm and holds pets such as dogs and cats in their own area. However, some user reviews mention that the installation instructions are poorly written. 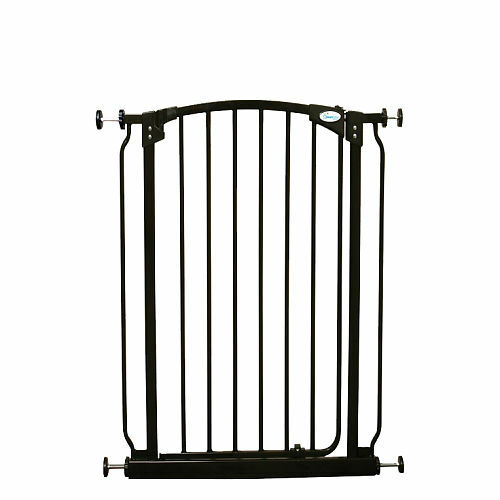 Overall, the Dreambaby Madison Xtra Tall Swing Close Gate Combo Pack is an excellent gate for safety at home. It is highly rated by users for its tall height, good features and durability. The available colors are black and white. works really well at keeping our cats and baby where we want them, and out of harm's way. Works great on hallway wall. I actually bought this product to keep my dogs & cats out of my living room and off the only carpeted room in my house and it works wonders!! This gate with pressure mounting works great and was easy to setup. 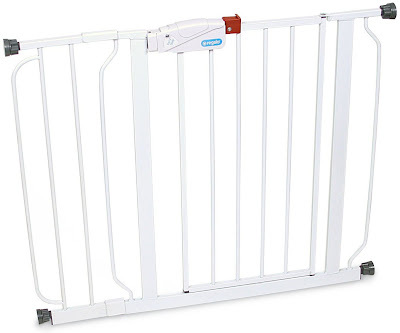 Bought this to keep our cats out of the loving room. Worked great and was easy to set up. This baby gate worked just great for my 4 dogs to let them in the house but separate from the living room. We didn't need to screw it into the doorway since the tension mechanism works well. I bought this gate to keep the baby in and the cats out. The gate keeps them separated. dog jumping up on it! It keeps the dogs seperate from the cats. It kept my dogs from roaming the whole house, and now it's keeping my dog and cat apart. I've 4 very large dog. They wanted to keep the dogs out of the nursery. It's tall enough to keep our cats out of the nursery and will be great to keep our child safe as well. If your looking for a gate for your dogs or baby's, get this gate. My husband and I purchased this baby gate, not for a baby, but for a dog. Gate is substantial enough to hold up to a 150 lb dog that has destroyed many other similar gates. Sturdy, durable, easy to install. This gate was very easy to install. It's easy to install and easy to operate. 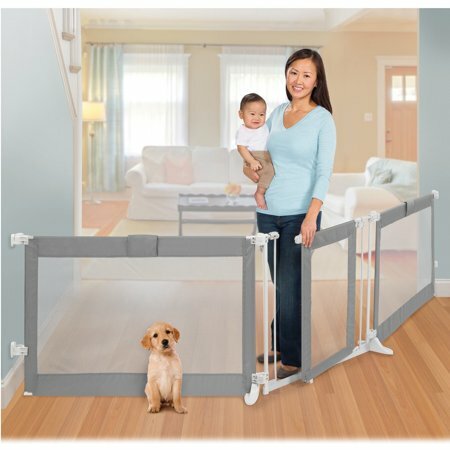 These baby gates are excellent--sturdy, easy to install, and easy to use. The instructions are poor, but installation was pretty easy to figure out. It's strong, well built and easy to install without tools. It was easy to install and it's very easy to use and actually looks pretty nice too! I loved that it was super easy for me at 7 months to install. This product was easy to install and it did the job. My son is very crafty at one and a half at opening doors but the extra height keeps him from physically being able to open it. My toddler can't get it open or climb this gate; but my older children can open it without help. The instructions also CLEARLY say you've to lift the gate to open it...so that shouldn't be an issue either....it opens very easily. I'd another type of swing security gate but I've arthritis in my hands and couldn't open it where this gate can be opened easily with one hand. Our 1 year old definitely won't be able to open this on her own.We also love the automatic close feature and that the gate opens both ways. it'd be difficult for toddler to open but my 5 year old can open it herself. Have to slightly lift up on gate and use a bungie cord to keep open. Like the fact it opens both directions also. The only problem is that it's a little difficult to open when you've your hands occupied.